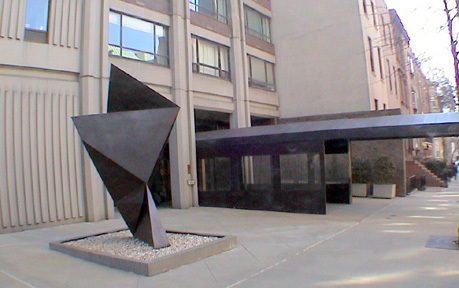 One of the anchors of the "new" residential Third Avenue on the Upper East Side, the Phoenix was one of the first of the many tall towers that would transform the avenue in the 60's into one of the city's most attractive enclaves. 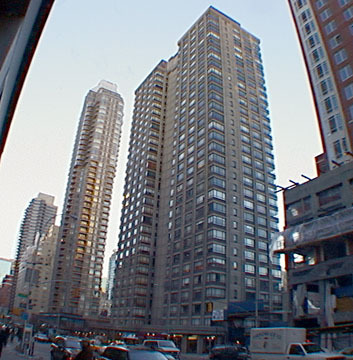 Built in 1969, the 31-story tower, which occupies the west avenue frontage between 64th and 65th Streets, rises without setbacks above its one one-story commercial base. That base was distinguished by its handsome and unusual angularity that was set back from the building line providing more sidewalk space. 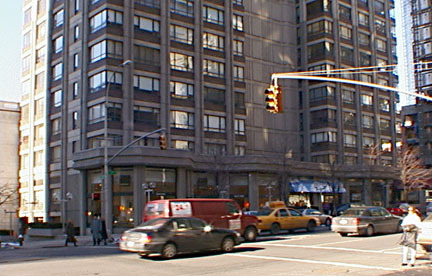 By setting the retail base in a distinctly different architecture style from the tower, this building established a trend that would be followed by many of its neighboring towers. The treatment here remains the best as it is open, inviting, and markedly different. In the 1960s, many urban planners were concerned that too many new buildings, especially in midtown, had blank walls along the street that they felt were deadening and unattractive. The angled bays here are pedestrian-friendly but they also are store friendly because it is not a continuous straight wall of shopwindows. The building's center, containing the elevator core, along the avenue was recessed considerably to give the building a more interesting form. Its north and south facades are enlivened considerably by the asymmetrical placing of the windows. 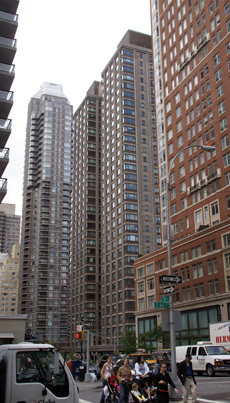 The 179-unit tower has no balconies, but most apartments have corner windows and superb views. Although later towers in the area would have a bit more gloss, this helped set the standard with its spacious lobby and landscaped entrance and unusual plaza. A small garden designed by M. Paul Friedberg is behind the lobby. Its location is superb and relatively quiet for this neighborhood. It was converted to a cooperative in 1984. 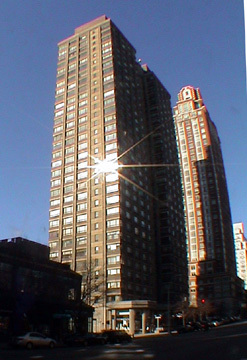 The building was designed by Emery Roth & Sons, who also designed the somewhat similar Tower East (see The City Review article) further up the avenue at 72nd Street in 1962.